Country living at it's very best, close to Marlborough's many wineries. This private accommodation is a welcome retreat in stunning Wairau Valley. Beautiful gardens, walk the frog trail or watch the birds bathing in the pond, see the gold fish at the surface looking for their treat. Desmond our pet sheep likes the attention too, and is fond of carrots. Jump in the heated pool or relax in the swing chair looking at Mount Fishtail. The lodge is named after Mount Fishtail behind our lodge. The lodge has a lounge, dining table, and a specious bathroom. The bedroom has a queen size bed and 1 single bed. We have a second single bed available if needed. Mike's famous breakfast is a must have and we have Wi-Fi for our guests and a laundry facility. 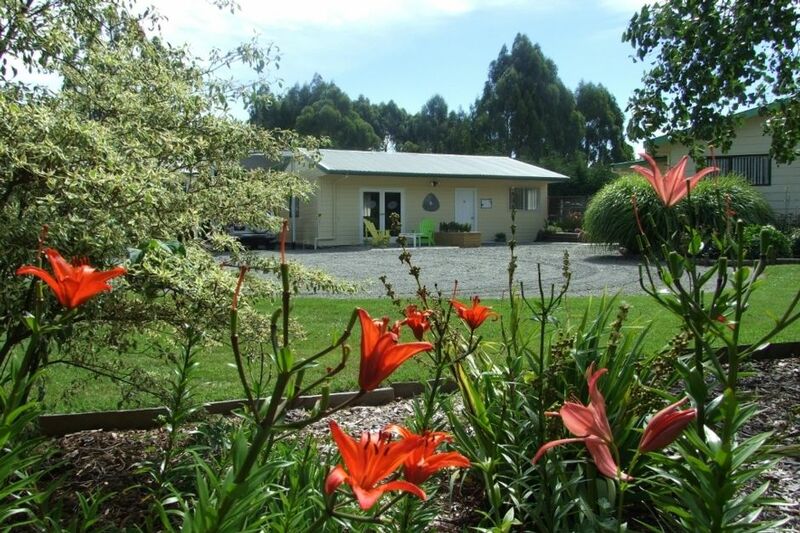 The Wairau Valley golf course is a 7 minutes walk and the oldest Marlborough tavern is even a shorter walk. Just come along and explore this special township. Mike and Mariette love sharing this very special place with our guests. We want you to relax in beautiful surroundings, catch a couple of brown trout with Mike your host and guide and let us treat you to the very best hospitality that Fishtail Lodge can offer. Visit Blenheim many attractions like the Omaka Aviation centre, musea, or boat trips in the sounds. Perfect location, close enough to Blenheim to visit some nice wineries. The B&B is looking out over a stunning garden, it is a quiet place with two great hosts. Delicious breakfast served every morning. Thanks for the great hospitality. We are happy that you had such a good time at the B&B. We like the conversations and your company. You left the lodge spotless. We loved the location and the quiet. We loved the location and the quiet. The little things around the property were special. I was a pleasure having you and that you enjoyed the surroundiings. Always good to have good company.Thank you for your review. Wonderful location, a very comfortable stay with kind and generous hosts. Great location and everything you need and more, great breakfast and really lovely people. Convenient location between the vineyards of Blenheim and the mountain village of St Arnauds. Convenient location between the vineyards of Blenheim and the mountain village of St Arnauds. Roomy and well organised accommodation with very comfortable beds. More of a B&B with limited kitchen facilities but the hosts helped us out with that.